Hit Songwriter, Producer & Performing Artist, Billy Yates “does his rockin’ on the stage”! The healing power of music is Billy Yates’ ministry & with songs recorded by George Jones, George Strait, Kenny Chesney, Sara Evans & more, plus two concurrent shows in Branson, he stays busy evangelizin’. I had the privilege of connecting with Billy for a conversation & impromptu guerrilla style video shoot between his shows – the powerhouse Raiding the Country Vault concert & the more intimate Hit Songwriters in the Round. It was awesome to sit with him while he performed some of his hit songs in the theater setting before the crowd arrived. He shares his insights regarding our human vulnerabilities & how songs provide a vehicle to alleviate loneliness & suffering as well as lifting us into joy. Be sure to catch the moment when, during the Raiding the Country Vault concert, I knew I had to have him on The Naked Vibes Show! 4:33 – Billy Yates talks about moving to Nashville to pursue his dream of being a singer, finding great songwriters to mentor him, & recording his first song that was eventually recorded by George Jones. 5:03 – LIVE ACOUSTIC PERFORMANCE: Billy Yates plays the intro to “I Don’t Need Your Rockin’ Chair”, recorded by George Jones. The song won a CMA Event of the Year. 5:57 – “I do my rockin’ on the stage” is one of my favorite lines from this song. The song became an anthem, not only for Jones, but for many of his older fans who intended to keep livin’ large! George Foreman was a huge fan & appeared in a video for the song. 6:38 – Julia Cameron talks about, in The Artist’s Way, the importance of starting anything you desire to do at any age. It’s never too late! 7:18 – Billy Yates’ show is about to start at his theater, where we’re recording, so there’s a lot of activity in the room. He talks about the evolution of becoming a songwriter in Nashville by singing on song demoes for other writers. They encouraged him on the value of his gift for phrasing. He had to learn the craft to tap into his skill for writing lyrics & melodies. 9:04 – Frank Dycus & Dean Dillon were instrumental in Billy’s development as a songwriter. He’s written & recorded many songs with them & says he most enjoys the friendships & feels like it’s therapeutic to collaborate, putting a puzzle together with others & having fun in the process. 10:09 – Billy talks about the inception of the creative process as a gift from God. He’s dreamed complete songs – when he wakes up & records them, he knows it’s coming from something beyond him. 11:11 – Music is healing. We don’t think about how important it is to our lives. Songs help us to feel less alone, uplift us when we’re down, & often teach us to see ourselves. 11:45 – Billy Yates likes writing from a first person perspective because it helps the listener connect with the artist. He knew his song “Choices” had to be recorded by someone who could really own it & allow themselves to be very vulnerable in performing it. George Jones made it a hit. 12:34 – All human beings have the same experiences – pain, joy, hardship, love – even though they may come in different shades. This is how even the solo writing experience becomes collaborative with the recording artist, making it their own by bringing their personal experiences & emotions to it. 13:23 – “Choices” was written Billy Yates with Mike Curtis, a great piano player & melody writer. He was coming to Billy’s house to write & Billy didn’t have a piano. Billy told him, “We’ve got three chords & the truth; that’s all we’ve got today!” Though they didn’t have George Jones in mind when writing the song, they eventually approached him with it because Billy felt like it was a song that offered healing. 14:00 – Billy knew the song would eventually find its way to the right artist. It took some time before it was recorded. 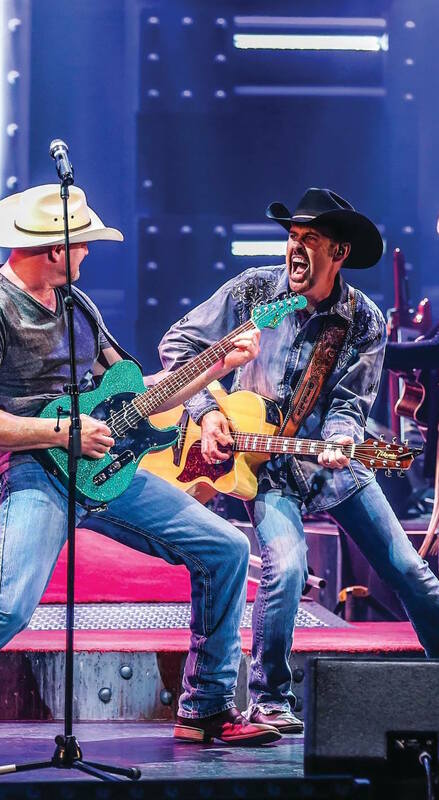 When he was touring with Alan Jackson, Alan played it while sitting around on the bus a lot & Billy thought he’d record it, but he never did. Alan did play a piece of it on an awards show. George Jones heard the song multiple times, but it took a while before he decided to record it. Billy believes it hit a bit too close to home. Billy refers to it as a “fill in the blank song” because, though it talks about drinking & the effects of it, any person can still relate to it by filling in their own personal hang-up. It comes down to the consequences of our choices, whether good or bad ones. 15:24 – LIVE ACOUSTIC PERFORMANCE – Billy Yates plays “Choices”. 18:49 – It takes courage to allow the kind of vulnerability that comes through when performing songs that touch the deeper issues of life, as “Choices” does. Billy talks about the boost the song gave to Jones’ career, winning him a Grammy, but he believes it was even more important for Jones on a spiritual level. After Jones recorded “Choices” & before it was released, he was playing it over the phone for his stepdaughter as he was driving home from Nashville. There was some Vodka involved & he hit a bridge, a wreck that almost killed him. Jones later told Billy that he felt like he was being given a second chance & he turned his life around. 21:00 – Billy talks about the vulnerability of songwriters & performers, even moreso, & our desire for encouragement when we express ourselves. It may have a lot to do with what drives us into performance as a profession. Music is healing. Musicians & performers are healers. Billy Yates has always viewed his career in the music business as a “calling”. He grew up singing gospel music with his family & many people still feel like they need to keep praying for him because of his choice to sing country music. He says that’s okay; he’ll take all the prayers he can get! However, it’s important to understand that we’re not all called to be church preachers. We minister to others by following our own unique, God-given gifts to help others. Billy has toured Europe for fifteen years & it’s his “ministry” to put smiles on faces & bring people joy through the healing power of music. 23:23 – Billy invited my uncle, Wood Newton, to perform at Hit Songwriters in the Round & that’s what got me to Branson. 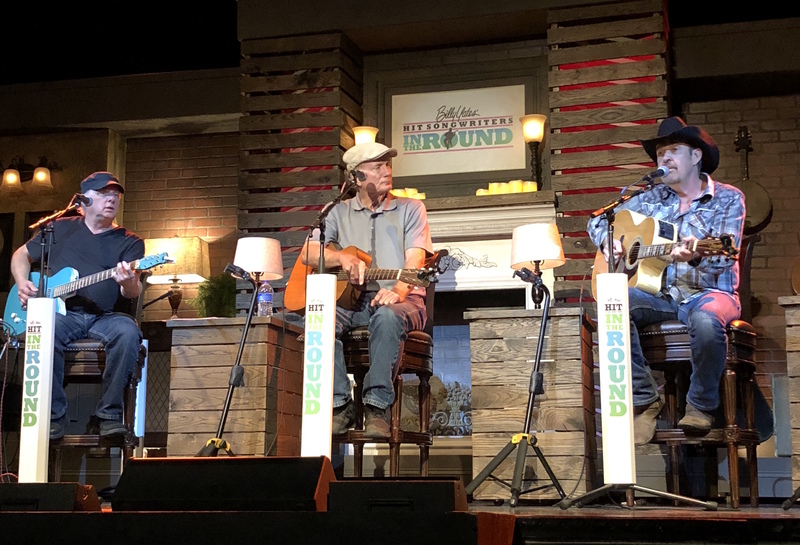 I was so inspired by the show, as well as the other concert he does – Raiding the Country Vault – I knew I had to jump on it & get a guerrilla-style recording for a podcast with Billy! So, this was very impromptu! I wanted to tell people about Hit Songwriters in the Round because it’s different from other things going on in Branson. It’s a real Nashville-style experience. 24:33 – Billy started Hit Songwriters in the Round as a leap of faith. Branson has a lot of great talent & there’s a lot of friendly competition, so it takes a lot to start a new show. But he was missing his songwriting friends & wanted to figure out a way to bring them in to work with him. It’s working, because he’s seen how much joy it brings to audiences, as well as to the songwriters who come in to perform, so it’s been well worth it. 26:30 – The moment I knew I needed to have Billy Yates on The Naked Vibes Show was during his performance in Raiding the Country Vault when he told the audience, “I’m naked in the show more than I have clothes on!” It’s a big concert with a lot of clothing changes. Billy goes straight from that show to the next. He’s a hard-working performer & has a lot of fun while he’s bringing it to his audiences. 27:26 – LIVE ACOUSTIC PERFORMANCE – Billy Yates plays a piece from a song he wrote for Kenny Chesney from his “Me and You” record – “Turn For The Worse”. 28:34 – Be true to who you are because your uniqueness is a ministry!